See smiles all around when you serve Tuna Noodle Casserole with Vegetables. 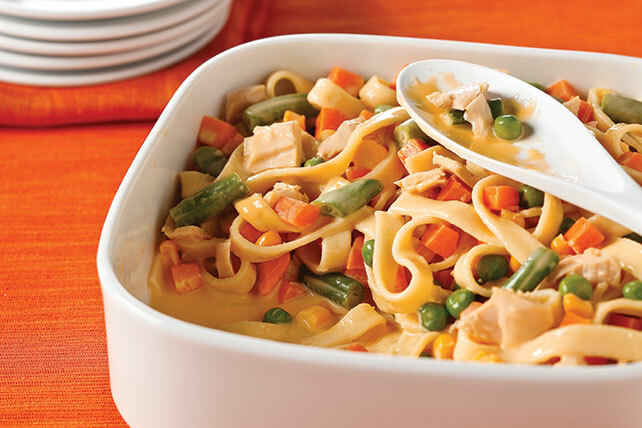 This Tuna Noodle Casserole with Vegetables is both easy and delicious! Cook pasta in large saucepan as directed on package, adding vegetables to the boiling water the last minute. Drain; return to pan. Stir in VELVEETA, tuna and milk. Spoon into 1-1/2-qt. casserole; cover. Prepare as directed, substituting 1 cup finely chopped cooked chicken for the tuna.